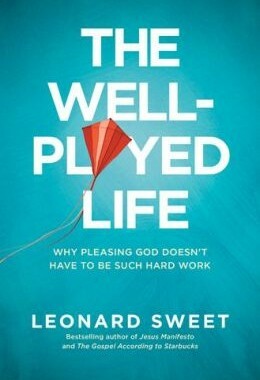 Len Sweet has penned a new book due out in March, 2014, entitled, The Well-Played Life: Why Pleasing God Doesn’t have to be Hard Work. This Tyndale House publication seeks to help Christians understand that discipleship is not work; it is play. We don’t work toward pleasure; we play in it. Yet we Christians seem more concerned about being “used by God” than living in a playful relationship and following the Spirit’s lead. Third-Agers (60-90): The important questions for this group are “How can I become a master player and world changer?” and “How can I be a coach to others in Godplay?” Third-agers cannot save the world but they are called to show the world the way in which it can be saved. The book is broken down into three sections corresponding to each of these three life periods. Each section describes what I am calling “discipleship in play” for each range of life. We need to let go of a “work for” ethic of attaining God’s pleasure and live in a “gracional (grace+relational) playground” with a dad who adores us and gives his loving, playful presence to his children. He is not a dad we have to work to obtain love from, but a father who gifts us his love because of the relationship we have with each other. And it is a playful, loving, grace-full relationship full of laughter and play and patience. Indeed, this is a reminder of the playfulness of a God who created mosquitos, the bane of all who live in the South during the summer! I too often find myself busy, not in play but in thought. Len asked recently on Facebook, “What’s on your mind when you’re thinking about nothing?” My response was that there was never “nothing” on the brain. It’s always churning and processing. For that I am grateful; however, I also realize that I can be too serious sometimes. Len reminded me of my own need to play and enjoy the presence of God. The way we live in Godplay is to live in the stories of the great Story-Maker, the God who didn’t lay down principles to get us to him, but joined us on a journey, a life filled with experiences – both good and bad – that shape us and form our identity. In some ways, I felt the underlying theme of this book was one of identity formation as our lives and experiences intersect with the Father God who walks with us and delights in us. And in another way, I see this as Len’s reminder to himself that he’s not old, that he – and all of us, in fact – have much to look forward to as we walk in play with God during our years. There are two criticisms or distinctions that I would note in this book. Though he makes it clear that the “ages” he references are not chronological ages, there doesn’t seem to a great distinction within the book of how they are different. Also, it seems to me that he makes the periods of life linear. I would see them as more of a spiral. In some areas we act like first-agers, but in others we are more third-agers. In reading this, I found myself resonating with aspects of all three periods, though I do find myself more in one period than the other two. This book was a reminder to me of the need to laugh, party, and play. As I said earlier, I find myself too serious sometimes. It was also a reminder that the best years of my life are yet to come… And it excited me! This book was provided by Tyndale House Publisher’s Inc for review.